Bulgar wheat is a high fibre and low fat whole grain that has been cracked and then parboiled. 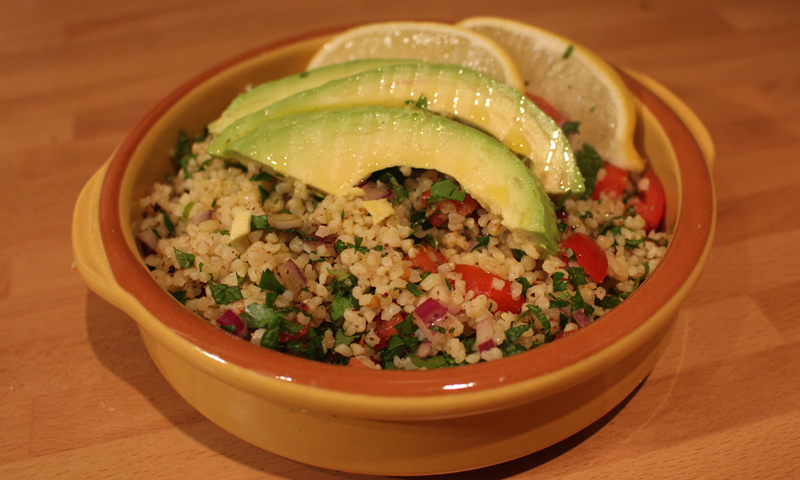 It’s a great substitute for couscous, quinoa and even rice, but tabbouleh is what it’s known best for and this is my version using avocado. Heat the stock in a pan until simmering and then add the bulgar wheat, increase the heat to bring back to a simmer if needed. Cover with a lid and let it simmer gently for 15 minutes. The stock should absorb quickly into the bulgar wheat so it almost steams when cooking. Add a little water if looking too dry and shake the pan so the wheat on the bottom doesn’t catch and burn. Check the packet of your bulgar wheat as cooking times/quantities may very. When cooked transfer the bulgar wheat into a large bowl and add a glug of olive oil and fluff with a fork so the grains are separated. You can leave to cool or you can add the rest of the ingredients now if you want to serve it warm. Add both the sumac and garlic to the bulgar wheat. If using a garlic clove you need to make sure its either well crushed or finely chopped. Half the tomatoes and cut those halves into quarters so you end up with eighths and add to the bowl with the wheat. Finely chop the onion and the fresh herbs and do the same, give it all a good mix. Only chop the avocado just before serving as exposed flesh will go brown quickly. Chop half of the avocado into cubes and mix gently into the tabouleh and slice the other half and set aside. Squeeze in the juice of a lemon and season with salt and pepper. Serve in individual bowls or one big one with the slices of avocado on top, wedges of lemon and a drizzle of olive oil.